Red Shirt’s Massada of Thailand. A New Model of Urban Protestation for a regime change in Asia pacific. Thailand named Siam by the British has conflicting opinions on its origins stretching over 4,000 years. Some claim they orginated from from Szechuan in China . Some claim they are the soilders of Genghis Kahan who remained behinded in the 13th cen. The modern archology shows evidence of bronze metallurgy, that the Thais might have originated here in Thailand and later scattered to various parts of Asia up unto China Mongolia. The early kingdoms were North and became the kingdom of “Lan Na” and the other one is in further south the kingdom of “Sukhothai” under the hegimony of Kemers. Sukhothai was the first Thai kingdom. It was founded in 1238 by two Thai governors, Khun Bang Klang Thao (Si Inthrathit) and Khun Pha Muang who rebelled against the Khmers; and gave independence to the region. Sukhothai period was the most flourishing period of Thailand. During this time Thai had strong friendship with neighboring countries. It absorbed elements of various civilizations which they came into contact. Thai maintained and advanced their culture with China. The potters entered Thai artistry and extensive trade was established with Cambodia and India. After the death of Khun Pha Muang in 1279, Ramkhamhaeng King, the third son of Si Inthrahit, ascended to the throne. Under the Ramkhamhaeng King, Sukhothai had strong friendship with neighboring China. Ramkhamhaeng King organized a writing system which became the basis for writing and eventually developed to be the modern Thai alphabet. SCENARIOS – Is Thailand headed for more stalemate? BANGKOK (Reuters) – Thailand’s government is pushing ahead with a reconciliation plan aimed at healing a social and economic divide and forestalling another uprising after the country’s worst political violence in modern history. The five-point reconciliation plan announced earlier this month calls for protection of the monarchy; reforms to address social injustice; an independent body to monitor media to ensure unbiased reporting; a committee to investigate recent political violence; and political reforms and constitutional amendments. Prime Minister Abhisit Vejjajiva has insisted he alone will decide if and when a new election will be held. He initially suggested Nov. 14 but that was rejected by the anti-government demonstrators blamed for the violence and rioting. Below is what could unfold in the next few months. Many areas are open to debate and the process therefore never takes off, leaving Thailand in a protracted stalemate with little indication of whether an election will take place to meet a key demand by the now-dispersed “red shirt” protesters. New leaders emerge within the red shirts and they question Abhisit’s suitability to lead a peace process, holding his government responsible for scores of deaths and injuries to hundreds of people, most of them protesters. An imminent no-confidence motion against Abhisit and several ministers by the red shirt-alligned opposition party, Puea Thai,is unsuccessful but serves to undermine the reconciliation plan. Puea Thai and the red shirts reject points in the reconciliation plan related to media, the judicial system and a probe into recent violence as one-sided and insincere. Abhisit’s elite backers, his supporters and the rival “yellow shirts” movement representing urban middle classes, are outraged he is reaching out to the red shirts, whom they brand terrorists for trashing the capital and damaging the economy. They rejected peace overtures before, so have no place in any reconciliation process, the government supporters say. LIKELIHOOD: Strong chance this will happen. Compromise and concessions are unlikely in the current climate, where gamesmanship, insincerity and divisiveness have prevailed on all sides. MARKET IMPACT: Foreign investors might take advantage of cheap Thai stocks during a protracted stalemate, but long-term investment will likely be curtailed as there is no light at the end of the tunnel. Tourists are still apprehensive and consumer confidence would remain low, although the government would have more time to work on economic stimulus measures. In Thailand the Red shirt Protesters fortified themselves like that of Masada between 37 and 31 BCE against the Romans in the Dead sea area. The last two months the Red Shirt of Thailand coming out of the rural poor and the urban under class started the first of its kind organized an urban revolt fortified like that of Masada. Since history does not repeat its self the same kind of way, the Red Shirts survived the government crackdown by cutting electricity and water like that of Massada the Romans cutting food and water . After the destruction of the Second Temple, the Jewish rebels and their families fled Jerusalem and settled on the mountain top, using it as a base for harassing the Romans. In contrary to Massada the Red Shirts are not fighting a foreign enemy occupying their land . They set new standred for regime chnage in Asia pacific and the rest of the third world. We can not denay the Thai government has showed the best of its patience to end up the Massada of Thiland. They even proposed 5 point road map for the resolution of the protest which is rejected by the Red Shirt. Later days the government rejected any discussion with the reds. Today 18 years after 1992 coup on the same day the the Red shirts of Bangkok who chose death rather than surrnder were dfused and start burning their capital city. May 19 Thai security forces backed by armored vehicles seized control of a protest site in central Bangkok and detained several of the group’s leaders after a six- week standoff which was easily accessible than that of historical Massada. The Red shirts were diffused but not dispersed with all the crises of Thailand. The of the leader of the ed shirt named ” Nattawut Saikuar, declared to his supporters in a live broadcast from the camp’s main stage. “We want to stop more injuries and deaths,” he said before rushing off to the sound of sporadic gunfire. 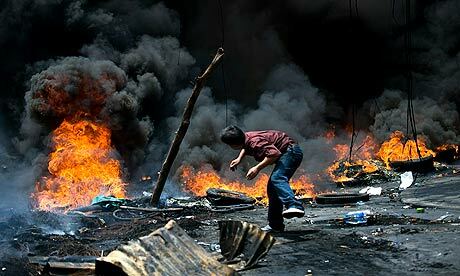 Street battles in the past week between security forces and demonstrators killed more than 40 people. The Red Shirts, who view Prime Minister Abhisit Vejjajiva’s rule as illegitimate, drew thousands of supporters to their two-month protest, underscoring the nation’s widening class divide. Today’s clashes killed four people including an Italian journalist, Petchpong Kumjornkijjakarn, head of Bangkok’s medical emergency unit, told reporters. Gunfire could still be heard around the site after the government’s announcement. “If they move closer to the stage, more lives will be lost,” said Jatuporn Prompam, another protest leader. Kasikornbank Pcl, Thailand’s third-biggest bank by assets, said a fire broke out at a branch on Rama IV Road near the main protest area. Plumes of black smoke rose above the edge of the site. Soldiers advanced along Wireless Road and television footage showed army vehicles smashing through barricades. The Bank of Thailand ordered all financial institutions in the capital to close at 1 p.m. because of security concerns, it said in a statement. The benchmark SET Index rose 0.7 percent before closing at the morning break. The baht fell 0.1 percent. Red shirt supporters set fire to a city hall in Udon Thani Province in northeast Thailand. In northeast Khon Kaen, protesters broke into the city hall to demand an end to the military assault in Bangkok through Channel 3 TV which was set infire imidately after as pro governmental media by the millitant black shirt faction of the RedShirt. Exiled former Prime Minister Thaksin Shinawatra, to whom many of the protesters express loyalty, called for direct talks between the government and rally organizers. Nine people were submitted to the Police General Hospital at the camp site with injuries this morning, three with gunshot wounds, director Jongjate Aojanepong said by phone today. Many demonstrators are loyal to Thaksin, a billionaire who won over the poor in the northeast of the country by giving them cheap health care and loans. The demonstrators, angered by one of Asia’s widest income gaps, say Abhisit embodies a privileged class of military officers, judges bureaucrats and royal advisers that sits above the law. Thaksin, who was ousted by the Thai army in 2006, fled the country in 2008 before a court sentenced him to two years in prison for helping his wife buy land from the government while still in power. Since 1946, when King Bhumibol Adulyadej took the Thai throne as an 18-year-old, Thailand has seen nine coups and more than 20 prime ministers. Only two of 17 constitutions since absolute monarchy ended in 1932 have mandated parliaments that are entirely elected. The king, who is revered across the nation, has been in hospital since Sept. 19 and hasn’t spoken publicly about the current demonstrations. Abhisit himself has never won a national election: He was picked by legislators in December 2008 after a court dissolved the pro-Thaksin ruling party for election fraud. The decision coincided with the seizure of Bangkok’s airports by protesters wearing yellow shirts who oppose Thaksin. For many observers, Thai politics is defined by a compelling but misleading image: the then prime minister, Suchinda Kraprayoon, andprotest leader, Chamlong Srimuang, sitting on the floor on 20 May 1992, while King Bhumibol Adulvadej admonishes the two former generals to settle their differences amicably. Prior to this royal intervention, scores of people, mainly unarmed demonstrators, had been killed in street protests against a government widely perceived as illegitimate. Four days later, Suchinda, the former army commander and 1991 coup maker, resigned. As the king declared prophetically, “There will only be losers.” Suchinda’s career was over: I saw him a few years ago getting off a Thai Airways flight in London, a broken man in a crumpled suit. The once feverishly popular Chamlong, an ascetic “half-man half-monk”, found his own route to the premiership permanently blocked. Given the terrible violence of recent weeks, and a death toll now matching that of May 1992, why does the king not intervene again? The idea that public royal reprimands are a standard Thai operating procedure is not really correct. A royal dressing-down is a last resort, one which relies on those who are summoned to submit meekly and go home quietly. Such interventions are a losing proposition for the political system, and potentially also for the royal institution itself, since the stakes are extremely high.At present, it is an open question how the redshirt leadership would respond to any summons. In practice, most royal moves take place behind the scenes, and are carried out not by members of the royal family at all, but by “network monarchy” – a loose alliance of courtiers, establishment insiders and freelancers who have no actual hotline to the palace, but are believed to be (or believe themselves to be) acting in the interests of the monarchy.In April 2006, responding to earlier public demands for monarchical intervention, the king made a major speech, in which he declined to act directly, and instead urged the judiciary to resolve the country’s political crisis. Since then, Thailand has experienced a striking judicialisation of politics: the courts have annulled an election, abolished political parties, and given more than a hundred politicians five-year bans from office. The only alternative to judicial interventions has been the rather disastrous military coup of September 2006, which completely failed in its real aim of reducing former prime minister Thaksin Shinawatra’s remarkable popularity. Instead, the coup left a legacy of bitter colour-coded division between pro-Thaksin and anti-Thaksin forces.In recent years, the task of intervention has been delegated to other elements of the state. Whereas in 1992 the king’s words matched an emerging consensus that Suchinda had to go – and that Chamlong had gone too far – 18 years later there is no such common ground. Between redshirted Thaksinites and yellowshirted royalists run bloody scars that cut right through Thai society; and these are not wounds that any words of wisdom could easily heal. For the fourth time in forty years, troops have opened fire on pro-democracy demonstrators in Bangkok. Each time, the aim has been the same: to protect the interests of the conservative elites who have run Thailand for the past 70 years. For those watching the cold-blooded murder by soldiers on the streets of Bangkok, it may be tempting just to assume that the present chaos is merely about different coloured T-shirts and supporters of different political parties, as though they were mirror images of each other. This is not the case. What we have been seeing in Thailand since late 2005 is a growing class war between the poor majority and the old elites. It is of course not a pure class war. Due to a vacuum on the left in the past, millionaire and populist politicians like Thaksin Shinawatra have managed to provide leadership to the poor. The urban and rural poor, who form the majority of the electorate, are the “Red Shirts”. They want the right to choose their own democratically elected government. They started out as passive supporters of Thaksin’s Thai Rak Thai government. But they have now formed a brand new citizens’ movement, for what they call “real democracy”. For them, “real democracy” means an end to the long-accepted “quiet dictatorship” of the army generals and the royal palace. This situation allowed the generals, the king’s advisors in the Privy Council and the conservative elites to act as though they were above the constitution. Les majeste (which outlaw “insulting” — criticism of — the monarchy) laws and intermittent repression have been used to silence opposition. Ever since 2006, these elites have blatantly acted against election results by staging a military coup, using the courts to twice dissolve Taksin’s party and by backing mob violence by the anti-democratic royalist “Yellow Shirts”. The present misnamed Democrat Party government led by Prime Minister Abhisit Vejjajiva was manoeuvred into place by the army. Most of those in the Red Shirt movement support Taksin for good reasons. His government put in place many pro-poor policies, including Thailand’s first ever universal health-care system. Yet the Red Shirts are not merely Taksin puppets. There is a dialectical relationship between Taksin and the Red Shirts. His leadership provides encouragement and confidence to fight. Yet the Red Shirts are self-organised in community groups and some are showing frustration with Taksin’s lack of progressive leadership, especially over his insistence that they continue to be “loyal” to the crown. Over the past few days, the Red Shirts have shown signs of self-leadership to such an extent that the old Red Shirt politicians are running to keep up. A republican movement is growing. Many left-leaning Thais like myself are not Taksin supporters. We opposed his human rights abuses. But we are the left wing of the citizens’ movement for real democracy. The Yellow Shirts are conservative royalists. Some have fascist tendencies. Their guards carry and use firearms. They supported the 2006 coup, wrecked Government House and blocked the international airport last year. Behind them were the Thai army. That is why troops never shot at the Yellow Shirts. That is why the present, Oxford- and Eton-educated Thai Prime Minister has done nothing to punish the Yellow Shirts. After all, he appointed some to his cabinet. The aims of the Yellow Shirts are to reduce the voting power of the electorate in order to protect the conservative elites and the “bad old ways” of running Thailand. They see increased citizen empowerment as a threat and propose a “New Order” dictatorship, where people are allowed to vote, but most MPs and public positions are not up for election. They are supported by the mainstream Thai media, most middle-class academics and even NGO leaders. The NGOs have disgraced themselves over the last few years by siding with the Yellows or remaining silent in the face of the general attack on democracy. Despite being well meaning, their lack of politics has let them down and they have been increasingly drawn to the right. When we talk about the “palace” we have to make a distinction between the king and all those who surround him. The king has always been weak and lacking in any democratic principles. The palace has been used to legitimise past and present dictatorships. As a “stabilising force”, the monarchy has only helped to stabilise the interests of the elite. The immensely wealthy king is also opposed to any wealth redistribution. The queen is an extreme reactionary. However the real people with power among the Thai elites are the army and high-ranking state officials. If one is to understand and judge the violent acts which have been taking place in Thailand, we need a sense of history and perspective. Perspective is needed to distinguish between damaging property and injuring or killing people. With this perspective, it is clear that the Yellow Shirts and the army are the violent ones. A sense of history helps to explain why Red Shirt citizens are now exploding in anger. They have had to endure the military jackboot, the repeated theft of their democratic rights, continued acts of violence against them and general abuse from the mainstream media and academia. If they continue to resist, cracks may appear in the army. During the past four years Thai citizens have become highly politicised. Ordinary soldiers, recruited from poor families, support the Red Shirts. The stakes are very high. Any compromise has the risk of instability because it will satisfy almost no one. The old elites might want to do a deal with Taksin to stop the Red Shirts from becoming totally republican. But whatever happens, Thai society cannot go back to the old days. The Red Shirts represent millions of Thais who are sick and tired of military and palace intervention in politics. At the very least they will want a non-political constitutional monarchy. It is hoped that the Red Shirts will continue to move to the left during this round of struggle. 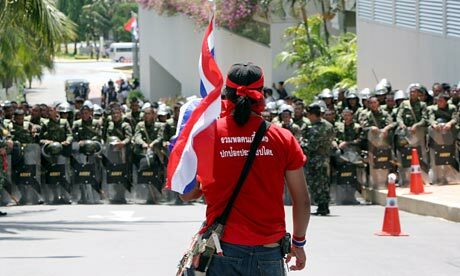 April 10, 2009 — In Pattaya, demonstrators — members of the National United Front of Democracy against Dictatorship (UDD), aka Red Shirts — broke the police cordon around the hotel where the ASEAN (Association of South-East Asian Nations) summit was to be held, demanding the resignation of the illegitimate government. The Thai government responded by declaring a state of emergency in Pattaya. The summit was cancelled. 1. No government anywhere in the world has the right to use troops to gun down protesters in the streets, especially when they are not carrying firearms. The Abhisit government’s use of the army to kill people in cold blood is an outrage. It is not “restraint” nor “the application of the Rule of Law”. It puts the Thai government on the same level as the Burmese junta and its aims are the same too … to hang on to illegitimate power and protect the interests of the privileged. 2. If observers want to pontificate about the “Rule of Law”, then they must first denounce the illegal military coup of 2006, the lack of partiality and accountability among the judiciary in dissolving the elected parties of government, the illegal seizure of Government House and the airports by the misnamed royalist Peoples’ Alliance for Democracy (PAD), the use of firearms and bombs by the PAD, the illegal bribes and threats to manoeuvre the Democrat Party into power, the illegal government-backed Blue Shirt gangs, who carried firearms and the illegal and extra-constitutional role of the palace and the king’s advisors in frustrating the functioning of democracy. None of the above cases have been punished. 3. There is a clear line between democracy and dictatorship. “Thai-style democracy” is an elite myth. The Yellow Shirts have repeatedly failed to respect the democratic wishes of the majority of the population. They want more appointed public positions and less power to the electorate. They want a “New Order”. They want censorship. They back the draconian lese majeste law which stifle the basic right to freedom of speech. The Red Shirts may not be angels, but they want a genuine democratic process without interference from the military, the king’s advisors or the palace. They would prefer to use the more democratic constitution of 1997, rather than the present one drafted by the military. 4. The anger of the Red Shirts over the past few days did not come out of nowhere. Since 2006 the majority of Thais have continually been abused politically by the elite Yellow Shirts, the mainstream media and middle-class academics. When pictures of Red Shirts smashing the PM’s car are shown, it is dishonest and bad journalism not to explain this. 5. The majority of Red Shirts support Taksin, not because they like to “hero worship”, but because his government brought in a universal health-care system and other pro-poor measures. The Democrat Party and the Yellow Shirts opposed these policies all along and knew that they couldn’t win popular elections as a result. This is why they wanted a coup. 6. Most of the Thai elite are corrupt, especially army generals and politicians. Why single out just Taksin? We need to punish them all or none at all. 7. The entire Thai elite support the use of state violence, whether it be in the [mainly Muslim] south of Thailand, in the “war on drugs” or against unarmed protesters. Taksin has to take responsibility for gross human rights abuses while he was prime minister. So does the rest of the elite, including Abhisit and the generals. There is a long history of Thai state crimes and we need to challenge this. We can start with denouncing the cold-blooded murder by troops on the streets of Bangkok this April.